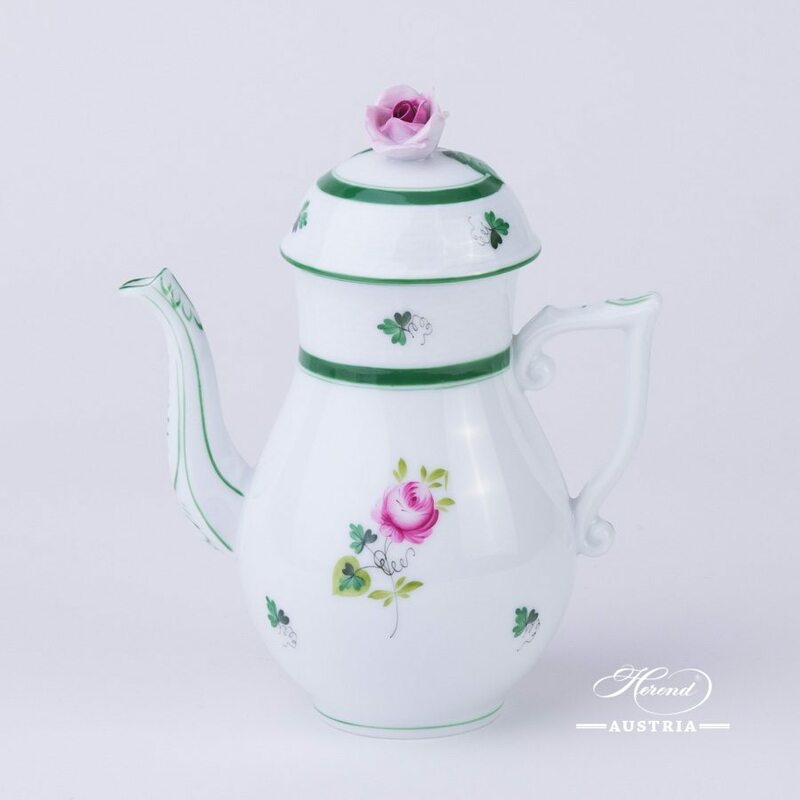 Coffee / Espresso Pot w. Rose Knob – Vienna Rose / Viennese Rose VRH pattern. Herend fine china – 616-0-09 VRH design. Vienna Rose design is a classical Herend pattern. 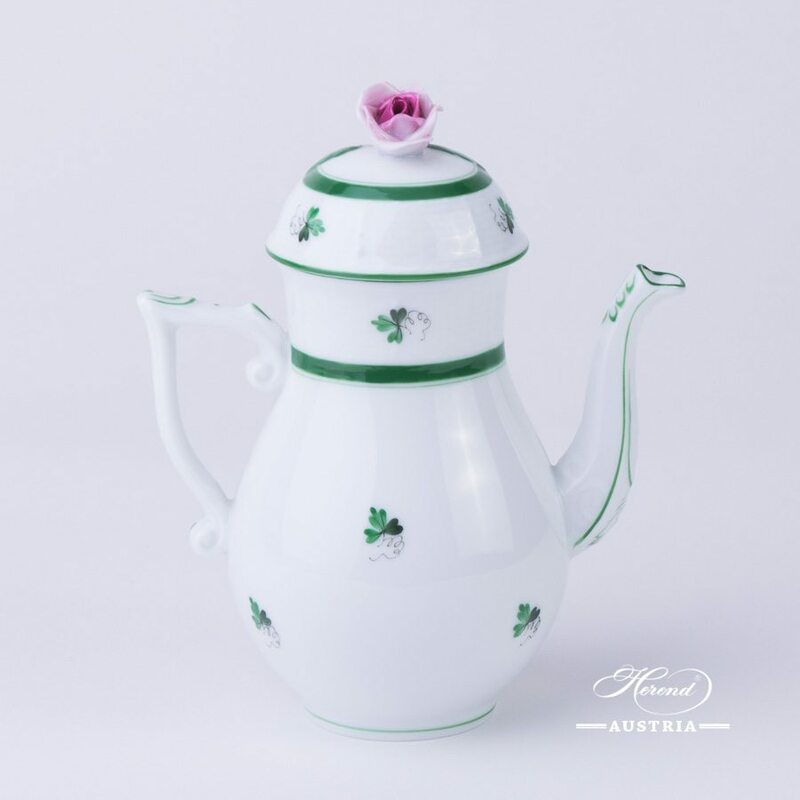 Vienna Rose / Viennese Rose VRH pattern – Herend Coffee / Espresso Pot w. Rose Knob. The centre is decorated with a blossoming Pink Rose surrounded by tiny Parsley motives. This pattern was used in the Court of Habsburgs. Herend Vienna Rose design is a classical Herend pattern. Be anywhere in the world, your order will arrive in 1-1,5 weeks (if it’s on stock). Your „on stock” items will be posted in the next morning of your order. 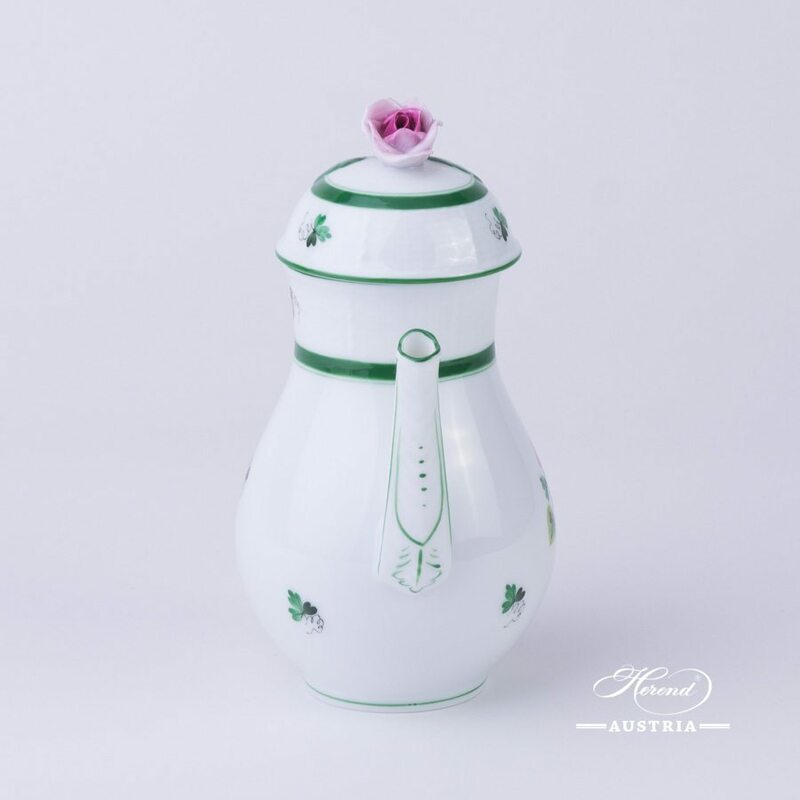 If your Herend is not on stock, we’ll order it ASAP, handmade it and your freshly made porcelain will be delivered in 4-8 weeks. Our delivery includes not only the transport, but the packaging and secure wrapping, insurance and the certificates as well. If your order exceeds € 500- your shipping is free. Tax in the EU is 20% for EU Citizens. Our prices in the Webshop are Net prices. The tax is added to the final price during Checkout. For non EU customers, the local Tax regulations needs to be applied. We wrap the items in 6-8 layers of extremely soft tissue paper, then we add several layers of bubble wrap. The safely prepared porcelains are put in a 3 layer box, the space is filled with soft papers. The box is heat and impact resistant by itself, but we’ll add additional shock resistant layers to the box to ensure maximum safety. Then we’ll put this box into another heat and shock resistant box (which is also 3 layered). 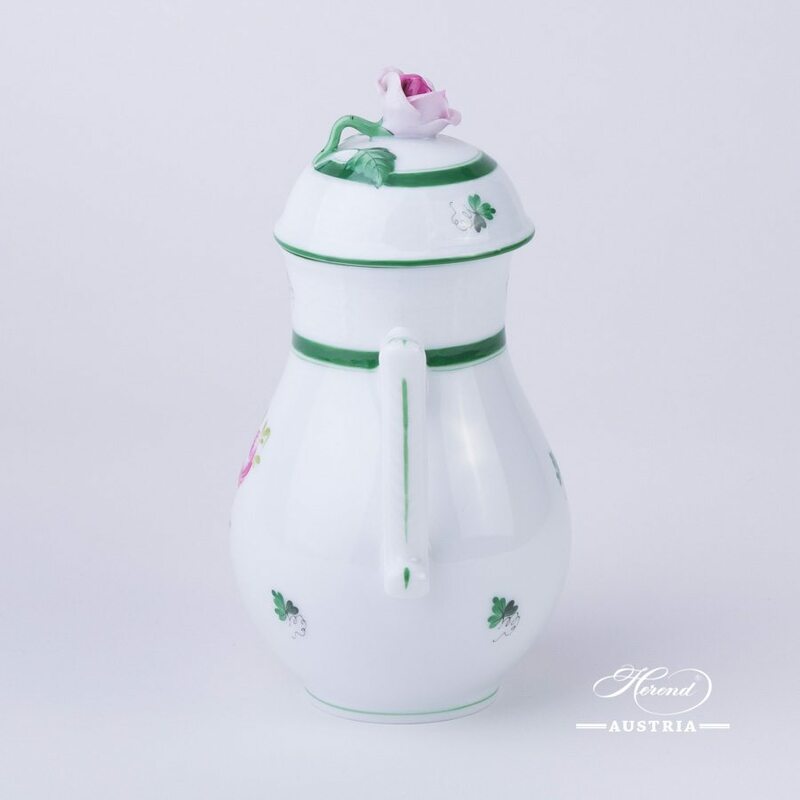 And only the most experienced professionals of Herend Porcelain Manufactory can package your order, the packaging process itself is inspected and supervised. You’ll receive the waybill data and other informations (e-mails, SMS). The package is virtually unbreakable when we finally post your order. But if your porcelains does not arrive in perfectly mint condition in our safe package, then we’ll send you new and perfect pieces again – free of charge of course. In this case you need to make a photo immediately and send it to us! Christmas Coffee Pot - 20613-0-06 NOEL - Herend Porcelain Coffee Pot with Twisted Knob. Volume: 8,0 dl Herend NOEL decor is a classical Christmas pattern. Candy / Biscuit Box - Vienna Rose / Viennese Rose VRH pattern. Herend fine china - 6206-0-09 C-VRH-OR design. Vienna Rose design is a classical Herend pattern. 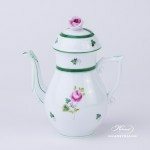 Silk Brocade Coffee or Mocha Pot - 3560-0-15 EGAVT - Herend Porcelain The Coffee Pot with Button Knob painted with Eglantine - Variete Wild Roses pattern. Usually EGAVT Decor painted on a unique Dubarry porcelain form. This pattern is rich gilded with relief 24 k. Gold. Painted only by the Master Painter! Herend fine china 4472-0-12 SPROG Sevres Roses - Coffee / Espresso Pot with Bud Knob. The Coffee Pot painted on an elegant classical Empire form. What is perhaps Herend’s most classical design. Queen Victoria Platinum design - Coffee / Espresso Pot with Rose Knob. Herend Fine china - 616-0-09 VBOG-X1-PT Herend Victoria Platinum decor is a modern Herend pattern. The overall effect is noble, elegant and modern! 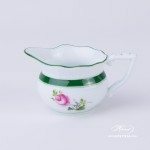 Creamer / Milk Jug - Vienna Rose / Viennese Rose VRH pattern. Herend fine china - 645-0-00 VRH design. Vienna Rose design is a classical Herend pattern. Tray with Ribbon - Vienna Rose / Viennese Rose VRH pattern. Herend fine china - 400-0-00 VRH design. Vienna Rose design is a classical Herend pattern. Tea Cup and Saucer - Vienna Rose / Viennese Rose VRH pattern. Herend fine china - 724-0-00 VRH design. Vienna Rose design is a classical Herend pattern. Sugar Basin w. Rose Knob - Vienna Rose Grand with Platinum - VGR-PT pattern. Herend fine china - 472-0-09 VGR-PT – modern design. Vienna Rose VRH design is a classical Herend pattern. Coffee / Espresso Cup with Saucer - Vienna Rose / Viennese Rose VRH pattern. Herend fine china - 709-0-00 VRH design. Vienna Rose design is a classical Herend pattern. Coffee / Espresso Cup with Saucer - Vienna Rose / Viennese Rose VRH pattern. Herend fine china - 735-0-00 VRH design. Vienna Rose design is a classical Herend pattern. Special Tea Set for 2 Persons - Vienna Rose / Viennese Rose VRH pattern. Herend fine china - Special VRH-OR-X1 design. Vienna Rose design is a classical Herend pattern. Golf Ball - Vienna Rose / Viennese Rose VRH pattern. Herend fine china - Viennese Rose VRH design. Vienna Rose design is a classical Herend pattern. The Golf Ball is an excellent gift for Golfers! 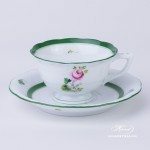 Coffee / Espresso Cup with Saucer - Vienna Rose / Viennese Rose VRH pattern. Herend fine china - 729-0-00 VRH design. Vienna Rose design is a classical Herend pattern.